As someone who has always brought a book along for those all-day treestand sits in the November whitetail woods (growing up, I wasn’t aware of any other type besides all day), I’ve always connected hunting with literature, and hunters with writers. Turns out, many of the qualities that make a good writer also make a good hunter. Self-motivation, observation, dedication to craft, imagination, attention to detail, and patience are needed to succeed in both pursuits. Those similarities could be part of the reason why many hunters are as good with a pen as they are with a bow or rifle. It makes total sense too, after all, the oldest story ever told was likely a hunting story. 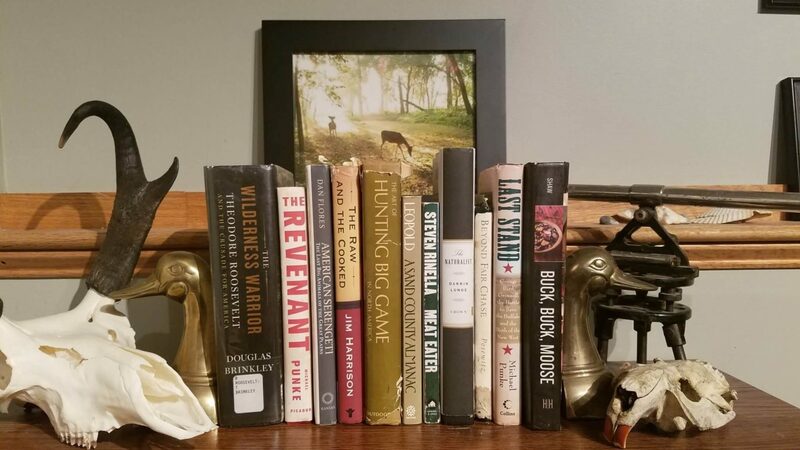 Today, I’m going to share a few of the hunting related books that will always have a spot on my bookshelf, located right below the skulls, shoulder mounts and turkey fans that these authors and their stories played a big part in inspiring me to go after. You’ll no doubt recognize many books on this list, but I think there just might be a few here that you’ve yet to find. If there is any one title that should be on the hunter’s bookshelf, it’s the classic A Sand County Almanac. Leopold, who is regarded as the founder of the science of wildlife management, essentially joins the hunter/conservationist movement to the newer, environmental movement while writing about his farm in Sand County Wisconsin. Published after his death in 1949, but based off writings that go back to the 1920’s, reading the book today makes it clear how soon we can forget the lessons of history, or refuse to learn them in the first place. Leopold does not write in a manner that seems like he is evangelizing some environmental crusade. Rather, he writes in a soft-spoken style that approaches a poetry that connects man to the deer, the deer to the oak and the oak to the land. If you are interested in gaining a larger perspective of the interconnectedness of all things wild and our role in it, read this book. Like Leopold writing on ethics of the land, Jim Posewitz was for me, the first author to really explain the ethics of the hunter as an individual. The act of taking a wild animals life should seem nuanced and maybe even complicated, yet Beyond Fair Chase explains the ethical framework in such a simple, honest and approachable way. This is because that even while Posewitz explains the need for a modern hunter’s ethic, he points out that the hunter is a predator fulfilling a necessary role in a world defined by predation. There are very few things simpler than that. Because of that inherent simplicity, as well as the brief 112 pages that make up the text, it reads not like a book of law, but reminds me more of a small, devotional books of essays for daily meditation. And I think that’s fitting, as to many the act of hunting is a spiritual one. While the previous entries on this list are short and simple, The Wilderness Warrior is a book heavy in both scope and length. Coming in at a whopping 817 pages, Brinkley dives deep into history of the conservation movement in North America through the lens of President Theodore Roosevelt, a man who set aside 230 million acres of wild America for all citizens. It’s a fascinating read, though at times the author takes overly long side-trips away from Roosevelt to cover some of the people and movements that shaped his mindset. Well worth the investment of time, I wouldn’t recommend hauling it up into a treestand. If there is one book on this list that I would bet most hunters haven’t heard of, its Last Stand. The book tells two stories that run parallel to each other before joining; the history of the American Buffalo, and that of George Bird Grinnell, the man who would become perhaps the single most influential individual to bring the species back from the brink of extinction. Grinnell makes for an exciting read. He is an almost Forest Gump like character, someone who crosses paths with so many iconic characters of a time period, that one would have to assume you are reading fiction. John James Audubon, Buffalo Bill Cody, George Armstrong Custer and a young Theodore Roosevelt all make an appearance in Grinnell’s lifelong fight for that symbol of America that is the Buffalo. Few would argue against the claim that Steven Rinella is the definitive hunting author of the 21st century. Through his articles, books, TV show and podcast he connects and speaks for the hunting public in much the same way O’Conner, Hemingway and Ruark, did for previous generations. His second book, Meat Eater is full of history, a bit of philosophy and no shortage of hunting stories. Where I enjoy this book the most though is that those stories are told through the thread of family, from three young boys hunting squirrels in the Michigan woods to those same brothers, now men, hunting sheep on the Alaska Range. It’s a story of fathers, sons and brothers and their connection to the wild within. I’d wager that every hunter has at some point dreamt of grabbing their pack and traveling to some distant land for the adventure of a lifetime. In most hunting literature over the years, Africa was the most common destination, especially during the first half of the 20th century and earlier. I’ve already mentioned guys like Robert Ruark and Earnest Hemingway, but others like John Henry Patterson, Peter Hathaway Capstick and Frederick Selous all helped put Africa on the map as THE place to go for an adventure with a rifle in hand. While hunting in Africa captured the imaginations of writers and readers, a land that is often overlooked was India, as was the quiet, humble man that spent his life hunting there, Jim Corbett. One of the big differences between Corbett in India and his peers in Africa was that Corbett seems to have gone about his hunting with absolutely zero sense for self-glorification or fame, all the while engaged in what can only be described as the world’s most dangerous game and living to tell about it. Jim Corbett wasn’t hunting in India just to collect trophies or stories. He was there to hunt man-eaters. During his career in India, he hunted over a dozen man-eating tigers and leopards on behest of the Indian people and their government. Animals whose individual body counts made Patterson’s Tsavo man-eating lions look like amateurs, and whose combined death toll reached over 1500 souls. Thankfully, besides living through these adventures, Corbett also wrote about them and it’s a good thing he did. Besides the obvious thrill of reading about a lone hunter putting his skills up against some of the world’s top predators, Corbett’s character also runs contrary to many of the misconceptions and stereotyping of big game hunters as chest beating glory seekers. Corbett respected and loved the animals he hunted, and he hunted to save lives. A committed conservationist, he helped establish India’s first National Park with the goal to provide habitat and protection for the endangered Bengal tiger, the same large cat he spent so many years hunting. To me, there is no single individual who better illustrates what it means to be a hunter than Jim Corbett. His thrilling stories illustrate his expert field craft, an intimate understanding of animals he hunted, a deep concern for the future of wild animals and a respect for the local peoples traditions and customs. I encourage everyone to pick up a copy of this collection of his writings. There is no shortage of cookbooks built around hunting and gathering your own food, but I can think of no other writer-chef that exemplifies that more than Hank Shaw. His three wild game cookbooks are a must for any hunter. The books are so much more than just a collection of recipes; each provides you with a brief history of the animal, instruction on field dressing and provides a detailed account of the cuts of meat as he walks you through the butchering process. Then there are the recipes; Hank’s enthusiasm is obvious for everything from elk leg roasts to fried squirrel. I can honestly say that I have yet to make a meal from his books that was anything less than excellent. Every new dish I try, becomes a new favorite. A perfect companion to Hank Shaw’s cook books is Steven Rinella’s two volume series on hunting, butchering and cooking both big (Vol. 1) and small (Vol. 2) wild game. A great read for hunters of any experience level, they are especially valuable if you are a new hunter, or a hunter new to pursuing a specific species. Each book takes you “nose to tail” through the entire process, from detailed information about license applications to gear selection, species descriptions and hunting strategies as well as step-by-step instructions on how to field dress, butcher and transport big game animals. Contributors to the books include many names and faces from the MeatEater podcast and T.V. show including Remi Warren, Doug Duren, and Janis Putelis, making these books the distillation of a lifetime of hunting knowledge. What books do you recommend? I’ve got some more space on my bookshelf, and I would like to hear your suggestions in the comment section below.